These are but a few of the amazing achievements reached by President Chavez and his government. The members of memoria Viva will continue to support the vision of President Hugo Chavez and the people of Venezuela via the work of Vice-president Nicolás Maduro. The Memoria Viva Society of Edmonton (MVSE) is a group of Latin Americans and Canadians living in Edmonton that actively work to preserve the progressive culture amongst the Latin American Diaspora in Canada. We choose not to forget why and in what context Latin American refugees came to Canada! We work towards building a strong community of Latin American and Canadians in Edmonton that actively participate in struggles for an alternative to the current socio-economic and political system, which continues to negatively affect Latin Americans and others throughout the world. Estimados miembros de nuestra comunidad, se hace un llamado a todos aquellos interesados en escuchar el primer borrador de la obra de teatro: Voy Soñando, Voy Caminando por favor asistir el 30 de Marzo a las 13:00 en la Escuela Pública Meyonohk, ubicada en la 1850 Lakewood Road South en Mill Woods. Se pide por favor que se registren anteriormente mandando un correo electrónico a mvedmonton1@gmail.com. Para mayor información por favor llame al numero 780-293-8496. Estimados miembros de nuestra comunidad, se les invita cordialmente a asistir a un encuentro cuyo objetivo es llamar a la participación en la planificación y implementación del programa de los 40 Años de Conmemoración del Once de Septiembre. Esta reunión se llevará a cabo el sábado, 30 de Marzo a las 4:00 PM en la escuela Meyonohk localizada en la 1850 Lakewood Road South en Mill Woods. Para mayor información llame al 780-293-8496 o manden un correo electronico a mvedmonton1@gmail.com. La Sociedad Memoria Viva hace un llamado amplio a todos que quieran participar y trabajar en estos eventos para conmemorar los 40 años del 11 de septiembre. Los esperamos el 30 de marzo. 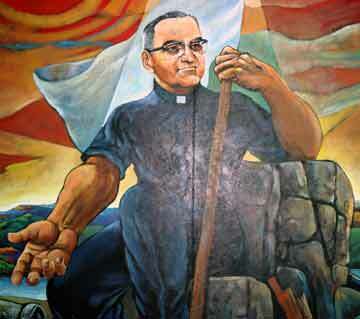 Archbishop Oscar A. Romero of San Salvador was assassinated by a military death squad while celebrating Eucharist in a hospital chapel on March 24, 1980 . He underwent a conversion after many of his priests and innocent lay people were murdered. In his homilies Archbishop Romero described the role of the church in denouncing “structural sin”. The economic, cultural, and political structures which effectively drive people to the margins of society. While he was alive, his voice was heard around the world denouncing injustices and violations of human rights. He supported public demonstrations for freedom and was the voice of the Salvadoran people when all innocent voices were silenced. His prophetic words, his courage and light continues to shine today and it is the source of inspiration to many around the world.